Through a project supported by the European Space Agency, the UK-based company Wired Ocean Ltd can now provide enhanced Internet access for ships at sea at a much lower cost than was previously possible. Although satellite links at sea are quite common, the speed of data transmission for most users is very low, from 600 bps to 64 kbps, with around 10 kbps being a typical speed. This, combined with usage costs of around € 20 per megabyte, has created an environment in which many ship owners cannot reliably access the Internet, or use it regularly. The Wired Ocean approach uses a hybrid solution, combining Ku-band satellites for the downlink and narrow L-band satellites for the return channel. While at sea, the downlink (forward) channel offers a speed of 512 kbps and the uplink (return) channel speed is 9.6 kbps for Globalstar and up to 64 kbps for Inmarsat. This configuration promises to be more economical than purely narrowband satellite systems, with cost savings of as much as 70% over current systems. The ship's internet communications are managed through a specialised client server developed by Wired Ocean. This server interfaces with a tracking TV Receive Only (TVRO) antenna for the downlink and various types of narrowband communications equipment for the uplink. 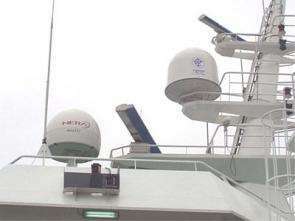 The ship's TVRO is used to receive internet data while simultaneously providing signals to the ship's televisions. By using Eutelsat's Eurobird located at 28.5° East and Hotbird at 13° East, Wired Ocean is able to provide its service for the two most watched European TV locations. As many ships already have TVRO and a satellite phone, addition of the Wired Ocean server now gives them the triple play (telephone, television and internet) for an incremental capital outlay. From July to December 2005, ten trials were carried out on various vessels, including five yachts in the Mediterranean Sea, three fishing vessels in UK waters and the North Sea, a container ship operating between Iceland and continental Europe and an oil & gas supply vessel in the North Sea. The trials proved Wired Ocean to be exceptionally reliable, with the satellite/hub operating at 99.954% availability and as much as 15.2 gigabytes of data was down-linked. The results of these trials not only demonstrated the pent-up demand for internet access at sea, but also that a reasonably priced service improves operational efficiency as well as the quality of life for crew and passengers aboard ships. In a survey of the trial users, the Wired Ocean system rated extremely well against other maritime data services. Connection set-up time and speed were all highly favourable. The ability to watch TV at the popular locations while accessing the Internet proved to be a 'must have' requirement. Access to the Internet via Wired Ocean puts a wide variety of applications at the disposal of the crew. Fishing vessels were especially interested in following the latest prices at various ports, while yacht owners made great use of the service to monitor the stock markets. Seven of the trial participants have announced plans to use the service on a commercial basis. A variety of companies have attempted to provide a low-cost hybrid service at sea but failed. While the concept sounds simple, actually delivering a service that meets the challenging user requirements set by the market is more difficult. The Wired Ocean service is fast, economical, reliable, secure, flexible and easy to use. In previous systems, one or more of these elements has always been missing. Wired Ocean's pilot trials were a continuation of the ESA Telecom supported project 'Maritime Interactive Broadband', which began as a result of the Start-up Projects Initiative. This initiative is designed to open the door for business innovation to small and medium sized enterprises (SMEs). The Start-up Projects Initiative helps SMEs through the early development stages of researching and refining a business proposition. The current project, 'Wired Ocean Pilot Service' has been supported in this way by ESA.